Music Together® and Canta y Baila Conmigo® is designed for children ages birth through kindergarten. We believe that music ability is as much a basic life skill as walking and talking, and that all children can learn to sing in tune, keep a beat, and participate with pleasure and confidence in the music of their culture. Our classes nurture the child's natural enthusiasm for music and movement as we sing, dance, chant, and play instruments in an informal setting that will enrich her musical environment and guide him/her towards a lifetime of music-making enjoyment. There is no reason to delay starting music class. There isn't anything that your baby needs to be able to do before you join the program. What is more important is that YOU are ready to interact and bond with your baby in a fun, relaxed, non-performance oriented environment. If you are curious about your child's interests, personality, and development, and you enjoy getting to know him/her and you want to learn how to best support his/her growing confidence and desire to participate and interact in an activity with you--his/her most significant caregiver--then you are ready for class! One of the comments we hear most often from parents is..."I wish I would have started with music class sooner". Our classes are also a great way to meet other children and families. Mixed-aged classes? Why aren't there separate classes for different age groups? In the 1980s, Music Together pioneered the development of the mixed-age approach in early childhood music. In each class we strive to create a musically rich, developmentally appropriate environment where the whole family can enjoy music and nurture skills at the level right for each child. Mixed-age classes also provide a rich learning environment because children of different ages thrive when they interact with each other: the babies are often fascinated by the older child, and the big children enjoy helping and sharing with the little ones. This approach is based on research from music education, early childhood development, and family relationships, as well as our 20 years experience in the field. Each class has 5- 12 registered children plus their primary caregiver(s). We encourage and appreciate you selecting a 2nd class option. If classes are too small they may be canceled or combined with another class. Throughout the semester, classes may be in session when older children have a school holiday. Older siblings of registered students may occasionally visit provided the older sibling is HEALTHY and that the visit is prearranged with the Songbirds Music. Visitation spots are available on a first come, first serve basis. If it is not a school holiday and older siblings have already attended one class there is a $15 visitors fee. Families are allowed to makeup any classes they miss. Makeups are available at any location run by Songbirds Music. You can schedule a make-up online by clicking on the "classes" tab and finding the online makeup scheduler. Do to our VERY flexible policy, makeups do not carry over from previous semesters. All makeup must occur within the same session or in a demo class. Missed classes will not be credited towards a future session. If you know you'll miss a class during the semester, please let us know and we will inform the teacher. Changes can be made depending on class space availability. Families wishing to withdrawal from class must do so before the registration deadline for each semester (typically the first day of classes). Families are responsible for class attendance. Non-attendance does not constitute a withdrawal and all tuition fees are forfeited if the Songbirds Music office is not informed of your withdrawal before the first class meeting. If circumstances necessitate withdrawal from class, please call the school office. NO REFUNDS. Late registration will be handled on a case by case basis. Please avoid just showing up for classes as they may be full, times may have changed, and teachers appreciate the advance notice. Please feel comfortable to nurse your child in class, but we ask that you not bring food or drink into classrooms. Snacking can be contagious and distracting. We also need to be sensitive to any possible food allergies. Both or either parent, grandparents or caregivers are welcome to attend class at any time; no need to ask. Whole family music making in your home is extremely valuable to your child's musical development, and attending class helps the other family members to join in at home. Try not to give verbal directions. It can be tough to restrain the impulse to give your child directives such as "Do what she is doing, hold your instrument this way; but children respond best by just seeing and hearing you doing (and enjoying) it yourself! Wandering toddlers is fine, but If you want your child to come back to you, avoid calling to him from across the room. If necessary, redirect your child physically back to you or the circle. Of course watch out for your child's safety, but mostly your job is to just relax, and have fun! How should we use the Music Together/Canta y Baila Conmigo Materials? Play your CD at home and in the car as frequently as possible, especially during the first few weeks of class. Download the "Hello Everybody" App so you have music on the go. Download the songs onto your computer/devices...it comes in handy in lines at the grocery store! Make it available to your child to listen to while she is playing or before nap or bedtime. Use the songbook to help you remember the songs or to play along if you play an instrument. 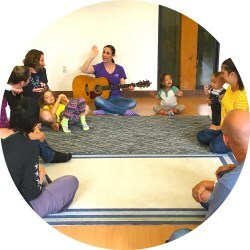 Try using the songbook at storytime instead of a regular book, and sing through the songs as you go along. Looking at the printed notes on the page will help children understand that music is something that can be read, like words. Familiarization with notation will help them when they are more ready for formal music instruction, typically when they are school aged. New Music Together parents receive our introductory DVD Music Together at Home: Helping Your Child Grow Musically. During class your teacher will refer to topics and point out examples of things covered in the video. We are also happy to discuss your child's individual progress in obtaining musical competence at any time outside of class. If you are a returning student and it has been months or years since you have read the Parent Guide or seen the new DVD, reread it or ask for a copy of the DVD today! You may be surprised how valuable it is, especially after having personal experience observing your child's music development. Gift certificates for any amount towards Songbirds Music classes can be purchased at any time. Click on the "Store" tab online or call our office to order. It makes a nice baby shower or birthday gift. Grandparents love to buy these for holiday gifts. Let us know if you would like it sent directly to the recipient or to the purchaser. Can I combine coupons/promotions/gift certificates? Promotions may not be combined with gift certificates and other special offers. Active military gets 10% off all classes more that 4 weeks long. Discount does not apply to drop-in or mini sessions. Email director@songbirdsmusic.com or text 858-412-0643 for the current military discount code.